In concurrence with our Annual Conference, Sister Cities International holds a Youth Leadership Summit each year where students from all over the U.S. and the globe gather to learn about citizen diplomacy and garner leadership skills for a future in international relations. This year’s Summit was extra fun for our students as they enjoyed the sites of Virginia Beach and worked together to solve international issues. Read below for our day by day recap of the Summit. On Wednesday July 12th, nearly 90 students arrived in Virginia Beach from across the U.S. and the globe for the 2017 Youth Leadership Summit. They settled into their dorm rooms at Virginia-Wesleyan, which, for many, served their first sneak peak of college life. At that evening’s orientation, students got the chance to socialize with their fellow future citizen diplomats and listen to Sheila Shamber, a Program Officer at the U.S Department of State — Bureau of Educational and Cultural Affairs and Sherry Mueller, Practitioner in Residence at American University and Author of Working World: Careers in International Education, Exchange, and Development. Following the speakers, students watched and interacted with local cultural dance groups who gave a performance. 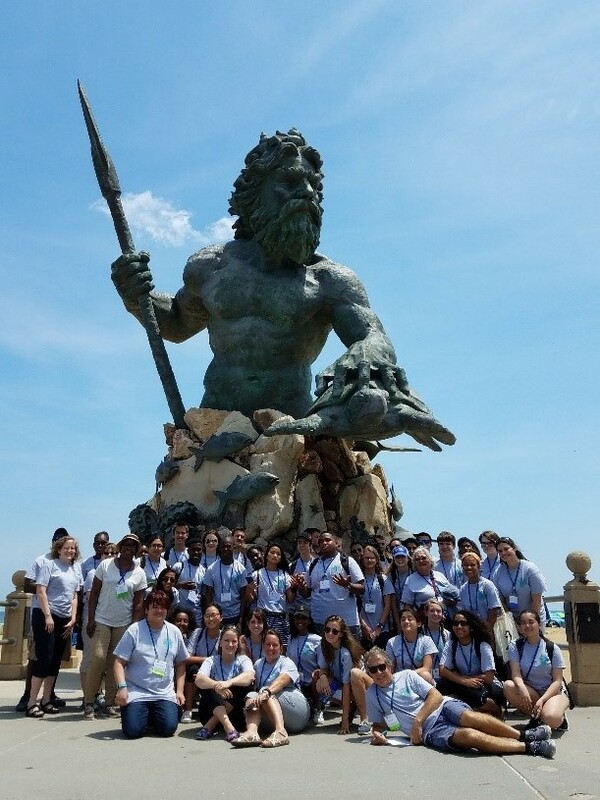 On Thursday, students took in some very special Virginia Beach sites that fit in well with this year’s YLS theme and simulation topic: Oceans and Food Safety. The students toured the Brock Environmental Center (one of the ‘greenest’ buildings in the nation) and were able to build oyster cages for a special project. The students also visited the Virginia Aquarium and Marine Science Center where they learned about marine wildlife and the importance of sustaining their ecosystems. For lunch, students explored the Virginia Beach boardwalk. That night, the students wrapped up the day with a visiting Peace Corps panel and learned about different career and travel options. On Friday, students participated in Sister Cities International’s Annual Conference by acting as flagbearers in the Parade of Flags and Opening Ceremony, and were welcomed by President and CEO of SCI, Mary D. Kane, Mayor of Virginia Beach Will Sessoms, as well as other speakers. Later on, students began their UN-style simulations on the topic of Oceans and Food Safety. The students acted as representatives of fictitious countries and attempted to resolve a real, critical issue of overfishing among the group. The simulations required attentiveness, cooperation, and negotiation in order to try to reach a resolution. That night, the students closed their day by attending the conference Beach Bash, where they were able to try foods from all of Virginia Beach’s sister cities and dance to a beach band. On Saturday, the students joined the Annual Conference attendees at the Keynote Luncheon where they enjoyed a cello performance and talk from Karim Wasfi, renowned cellist and Founder of ‘Peace through Arts Inc.’ The students loved his performance so much that they took several photos with him after! Finally, the students brought their simulation to a close and summarized their experience in front of conference attendees. The students were also able to reflect on what their plans are for the future and how the Youth Leadership Summit impacted those goals. Later, students ended their final evening in Virginia Beach at the Annual Conference awards dinner and danced to their favorite songs until it was time to go back to Virginia Wesleyan. On Sunday, students said their goodbyes to their peers and returned home with a new understanding of citizen’s diplomacy, career paths, and each other’s cultures, with many excited to return for next year’s Summit! To get stories from the network in your inbox every week, subscribe to our news clips email here. No Replies to "Oceans, Food Safety, and Fun! 2017 Youth Leadership Summit Recap"